To Kul on the "Ships starting with K" page. Built by Mackay Bros, Alloa, Scotland in 1907. Previous names: Grorud, Tello and Allan. According to this external page, she was delivered as Allan in March-1907 to A/S D/S Ocean, Aarhus, Denmark. From Febr.-1915, sailed as Tello for Johs. Lindvig, Kragerø, Norway and from Oct.- 1915 for A/S Tello (Johs. Lindvig), Kragerø. Owned from Febr.-1916 by Skibs A/S Fritzøe (Bugge & Olsen), Larvik, Norway, renamed Grorud. From 1918, Skibs A/S Grorud (Bugge & Olsen), Larvik, no name change. From 1921, owners were Skibs A/S Fritzøe (Bugge & Olsen), Larvik, same name. Owned from May-1923 by D/S A/S Kistransport (Thv. Halvorsen), Bergen and renamed Kul. From Oct.-1924, A/S Thv. Halvorsen, Bergen. Follow the convoy links provided for more information on each (please be aware that some of the listings may be incomplete). May 17 Blyth Southend May 19 FS 173 Convoy available at link above. (Page 1 gives arrival Aug. 9). Nov. 12* Clyde   OB 242(? *) *Compare w/Page 2 - see also narrative below. (Page 2 gives arrival Sydney, C.B. Dec. 8). July 10 Southend Methil July 11 EC 44 Convoy available at link above. *Convoy SC 42 left Sydney, C.B. on the date given by A. Hague - Kul departed Reykjavik on Sept. 13 and arrived Greenock Sept. 19/20. See also Page 3. 1942 Febr. 16 Methil Belfast Lough Febr. 19 EN 47 Earlier 1942 voyages, Page 4 above. *Page 5 gives arrival Belfast Lough, May 12. 1943 Febr. 14 Methil Belfast Febr. 16(*) EN 196 Earlier 1943 movements, Page 7. The majority of these 1944 voyages are not detailed on the archive document and, therefore, comparison cannot be made and accuracy confirmed. Page 11, Page 12, Page 13, Page 14 & Page 15. Kul is listed as sailing in station 43 of Convoy HN 9A from Norway to the U.K. in Jan.-1940. She's said to have started this voyage in Oslo, but lost touch with convoy in the afternoon of Jan. 28. She arrived Shields on Febr. 6, leaving again the next day, arriving Northfleet / London on Febr. 10 (note that she's mentioned twice in HMS Isis' report on my page about this convoy). Early in March, A. Hague has included her in the U.K.-Norway Convoy ON 17. She must have gotten out of Norway somehow, because she was in allied control during the war; in fact, according to Page 1, she arrived Amsterdam from Ballangen on Apr. 5 (Norway was invaded on Apr. 9). She later made a couple of voyages to France. At the end of July-1940, we find her in Convoy OA 190, bound for Sydney, C.B., station 85. This convoy left Methil on July 26 and dispersed on the 29th, and going back to the archive document mentioned above, we learn that Kul arrived Sydney, C.B. on Aug. 9. Bonde, Galatea, Hjalmar Wessel, Jernland (to Clyde only), Siak and Tai Ping Yang are also named in this convoy, see the external link provided in the Voyage Record. Kul headed back to the U.K. on Sept. 2 with the slow Sydney (C.B.)-U.K. Convoy SC 3, from which the Norwegian Lotos and others were sunk - follow the links for more details. Kul had a cargo of lumber for Warrington, where she arrived Sept. 18. According to the external website that I've linked to at the end of this page, Kul was scheduled for Convoy OB 243, which left Liverpool on Nov. 13, but she did not sail. Her destination on that occasion is given as Bathurst (N.B.). A. Hague says she had sailed in the previous convoy, OB 242, which had departed Liverpool on Nov. 11 and dispersed on the 15th, but I'm not entirely sure she could have been in this convoy either(? ); according to Page 2 of the archive documents she didn't sail from Clyde until Nov. 18, and arrived Sydney, C.B. on Dec. 8. (Again, see the external link in the table above for more convoy information; Brønnøy is also listed). From Sydney, C.B., Kul proceeded to St. John, N.B. and Parrsboro, before heading to Halifax to join a convoy back to the U.K.
Kul (having been cancelled from Convoy SC 18, Jan. 2) is listed among the ships leaving Halifax with the slow Convoy SC 19 on Jan. 12-1941, bound for Immingham with pit props in station 12 of the convoy. As will be seen when following the link, this convoy lost several ships; an analysis of attacks is also available. Kul is said to have lost touch with the convoy (on the day of departure? 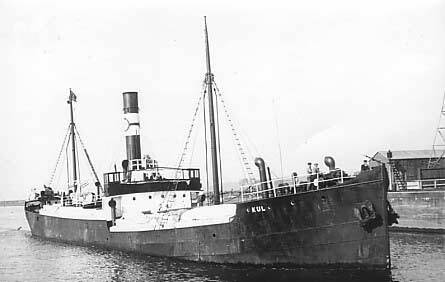 ), as did several other ships in the bad weather, including Ruth I, which was later damaged by aircraft. Kul arrived Clyde on Jan. 31 (Immingham Febr. 22). Later that year she shows up in the westbound North Atlantic Convoy ON 10, which originated in Liverpool on Aug. 27-1941. She was bound for Iceland only, arriving Reykjavik on Sept. 2, having started out from Loch Ewe on Aug. 29 - her voyages in this period are shown on Page 3. From Reykjavik, she headed back to the U.K. on Sept. 13, arriving Greenock Sept. 19/20. For this voyage, A. Hague has included her in the eastbound North Atlantic Convoy SC 42, which had originated in Sydney, C.B. on Aug. 30. She's not mentioned on my own page about SC 42, but that could possibly be because she joined from Iceland. This is the convoy in which Stargard and several others were sunk, follow the links for more info. Kul took part in Operation Neptune (with ammunition), arriving Normandy on June 8, leaving June 17-1944, according to "Nortraships flåte". As will be seen when going to Page 14, she got to go home to Norway already in the summer of 1945, making several voyages home in the course of that year - see also Page 15. Kul was carrying iron ore and a deck cargo of timber from Rønnskår to Eitrheim on Nov. 21-1950, when the cargo shifted in heavy seas and she capsized and sank near the Almagrundet lightship (Charles Hocking). OB (& OA) convoys - As mentioned, Kul is listed as scheduled for OB 243. Back to Kul on the "Ships starting with K" page.